Video courtesy: Clinic for the Rehabilitation of Wildlife. COLLIER COUNTY, Fla. -- A red-shouldered hawk is flying free again after a harrowing journey stuck in the front grille of an SUV. The hawk was brought to the Clinic for the Rehabilitation of Wildlife (CROW) on Sanibel in October after getting stuck in the front of a vehicle somewhere along Alligator Alley and driven to Fort Myers Beach. The driver noticed the bird the next morning and brought it to the clinic for help. While at CROW, the hawk was treated for head trauma and a fractured ulna and radius in its left wing. The broken wing required two surgeries and numerous hours of physical therapy for the hawk to regain full extension and use of its wing. After nearly three months of rehab, veterinarians decided the hawk was cleared for release. 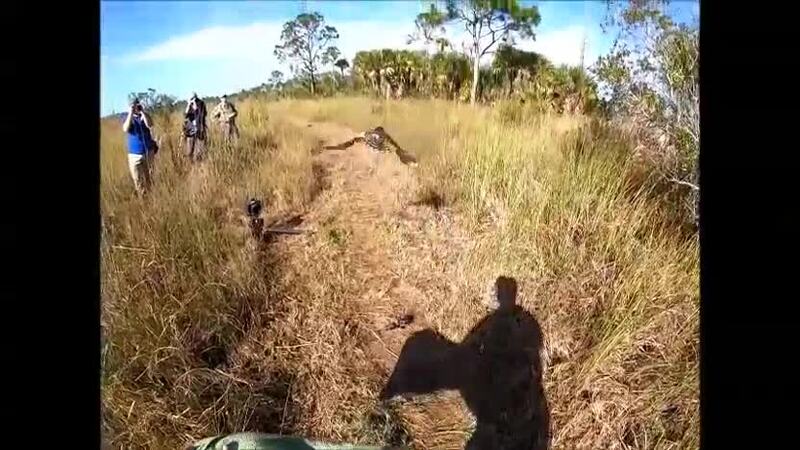 On Saturday, the bird was set free in the Florida Panther National Wildlife Refuge, near where it was believed to be hit by the SUV. Check out the hawk’s full story at http://bit.ly/RSHA18-3849.